WASHINGTON – The U.S. Department of the Treasury today announced the designation of seven individuals and five businesses tied to the Honduran drug trafficking organization, Los Cachiros. The individuals designated include the leaders of Los Cachiros, brothers Javier Eriberto Rivera Maradiaga and Devis Leonel Rivera Maradiaga, who play a significant role in international narcotics trafficking. Treasury also designated the following associates, among which are family members of the brothers, for the role they play in supporting the international narcotics trafficking activities of the brothers and the organization: Santos Isidro Rivera Cardona (father), Esperanza Caridad Maradiaga Lopez (mother), Maira Lizeth Rivera Maradiaga (sister), Santos Isidro Rivera Maradiaga (brother), and Bismarck Antonio Lira Jiron (a Nicaraguan cell leader for Los Cachiros). In addition, the five designated businesses are being used by the group to further the organization’s drug trafficking activities and launder illicit proceeds. Today’s action would not be possible without the support and cooperation of the U.S. Drug Enforcement Administration (DEA), the U.S. Department of State, and the Government of Honduras. “Drug traffickers and money launderers are put on notice: DEA in coordination with our foreign partners will identify, investigate, indict, and seek extradition of international drug traffickers and money launderers. We will seize their assets and ensure they will face justice for distributing illegal drugs. The Los Cachiros organization will be held accountable for their federal drug trafficking crimes,” said DEA’s Acting Deputy Chief of Operations for the Office of Financial Operations Brian M. McKnight. This action marks the U.S. Government’s second action against Los Cachiros in four months. In May 2013, the President identified Los Cachiros as a significant foreign narcotics trafficking group pursuant to the Kingpin Act. Today’s action generally prohibits U.S. persons from engaging in any transactions with these designees and freezes any assets they may have under U.S. jurisdiction. Los Cachiros coordinates the movement of drugs to and from Honduras for Colombian and Mexican drug trafficking organizations, including the Sinaloa Cartel. Los Cachiros employs land, air, and sea conveyances in its movement of drugs, and its activities have been linked to seizures of cocaine in Central America. It is reported that Los Cachiros controls 90 percent of the clandestine airstrips in Honduras, and it uses these airstrips to facilitate the entry of drugs into Honduras and Guatemala. In August 2012, Nicaraguan authorities charged Los Cachiros leader, Javier Eriberto Rivera Maradiaga, and Nicaraguan associate, Bismarck Antonio Lira Jiron, with conspiracy in the international transport of illicit drugs, money laundering, illicit financing of narcotics, and organized crime. Nicaraguan authorities arrested Lira Jiron that same month. The Honduran businesses targeted today are directed, owned, or controlled by Javier Eriberto Rivera Maradiaga or Devis Leonel Rivera Maradiaga or other family members who act on behalf of the brothers and their organization. The identified family businesses include: Ganaderos Agricultores del Norte, S. de R.L. de C.V.(cattle and agriculture); Palma del Bajo Aguan, S.A. (African palm oil production); Minera Mi Esperanza, S.A. (mining manufacturing); Inmobiliaria Rivera Maradiaga, S.A. de C.V. (road construction); and Inversiones Turisticas Joya Grande, S.A. de C.V. (zoo and eco-tourist park). “Today’s designation marks another step in [the Office of Foreign Assets Control] efforts to specifically target the narcotics traffickers responsible for the horrific acts of violence committed along the Arizona border with Mexico,” Adam Szubin, director of the OFAC, said Tuesday. The eight bosses named are Cenobio Flores Pacheco (a.k.a. “Luis Fernando Castro Villa”), Jesus Alfredo Salazar Ramirez, Guillermo Nieblas Nava (a.k.a. “Adelmo Niebla Gonzalez”), Ramon Ignacio Paez Soto, Felipe De Jesus Sosa Canisales, Armando Lopez Aispuro, Jose Javier Rascon Ramirez, and Raul Sabori Cisneros, all operate as plaza bosses for the Sinaloa Cartel. They’re accused of controlling smuggling operations along the 375 mile U.S.-Mexico border, including Arizona border towns like Sonoyta, Nogales and Agua Prieta. The bosses each run a town used as a shipping point for drugs, and also oversee the flow of guns and cash from the U.S. back to Mexico to fuel their war and increase their market share of smuggling routes. Drug Enforcement Agency Special Agent in Charge Doug Coleman says the new designation will hurt the group’s ability to launder their money. “In order to put organizations like the Sinaloa Cartel out of business, we must continue to utilize every tool available to ensure that these criminal groups and their associates cannot exploit the U.S. financial system,” Coleman says. Here’s a picture that points out each of the bosses and the plaza they control (Click here to view a larger image). “The Treasury Department on Tuesday said it has identified eight key members of a Mexican drug cartel after a yearlong investigation, setting off a chain reaction of enforcement measures. Pinpointing and calling out plaza bosses of the Mexican Sinaloa Cartel is an “important” victory, federal officials said on Tuesday, but they say actions are only beginning. 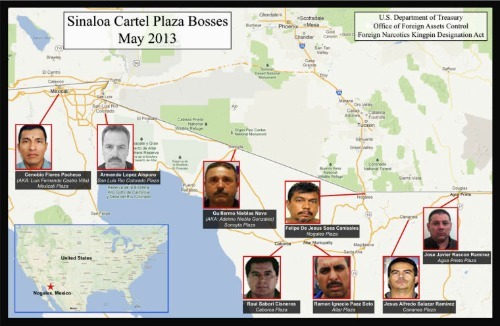 The eight men are strategically located along a 375-mile stretch of the Arizona-Mexico border and act as gatekeepers for drugs and other illegal goods smuggled into or out of the United States. In order of their outpost from west to east, the men are: Cenobio Flores Pacheco, Armando Lopez Aispuro, Guillermo Nieblas Nava, Raul Sabori Cisneros, Ramon Ignacio Paez Soto, Felipe De Jesus Sosa Canisales, Jesus Alfredo Salazar Ramirez and Jose Javier Rascon Ramirez – most of them also have aliases. They depend on violence and hit men to keep power in their designated area, according to the Treasury’s Office of Foreign Asset Control (OFAC), the agency tasked with enforcing financial sanctions on named terrorists and drug smugglers. The DEA, OFAC and the Customs and Border Protection worked together with the Mexican government to compile evidence against the men, said OFAC Director Adam Szubin. By bringing out these “pretty serious players,” Szubin said in a call with reporters, law enforcement will begin to see “follow-on” effects, including people being more aware of the individuals, denying them access to formal banking processes – and hopefully, arrests and fines. “In order to put organizations like the Sinaloa Cartel out of business, we must continue to utilize every tool available to ensure that these criminal groups and their associates cannot exploit the U.S. financial system,” said Drug Enforcement Agency (DEA) special agent in charge, Doug Coleman. The actions come on the heels of President Obama’s trip to Mexico, and members of law enforcement, Treasury and immigration agencies thanked authorities south of the border for helping with the investigations. Special Agent Carl Pike, with the Drug Enforcement Agency, said the Sinaloa Cartel is the oldest and most established in Mexico. As other cartels are growing weaker because of in-house fighting, Sinaloa is only growing stronger, he said. This is the fifteenth sanctioning action Treasury has taken against members of the cartel, or shell corporations it uses to launder money, since last January. Joaquin “Chapo” Guzman Loera, and Ismael “Mayo” Zambada Garcia run the organized crime and drug trafficking organization, which is named after the region in Mexico where it was formed. The Sinaloa Cartel controls 80 percent of the methamphetamine trade in the U.S., Mexico and Asia, according to a report released by Mexican researchers last month. It also deals cocaine, marijuana and opiates. WASHINGTON – The U.S. Department of the Treasury’s Office of Foreign Assets Control (“OFAC”) today announced the designation of Honduran national Jose Miguel Handal Perez (a.k.a. “Chepe Handal”), as a Specially Designated Narcotics Trafficker (“SDNT”) pursuant to the Foreign Narcotics Kingpin Designation Act (“Kingpin Act”). Also designated today are Handal’s wife, Ena Elizabeth Hernandez Amaya; his father, Jose Miguel Handal Larach; and several of Handal’s companies located in San Pedro Sula, Honduras. Companies designated today include Corporación Handal, which is comprised of various business ventures including a general merchandise and auto parts store, Supertiendas & Autopartes Handal, JM Troya, a motorcycle brand, and Cleopatra’s, a clothing store. Today’s actions generally prohibit U.S. persons from conducting financial or commercial transactions with these designees, and also freeze any assets they may have under U.S. jurisdiction. Chepe Handal is the head of a Honduran-based drug trafficking organization (“DTO”) responsible for the coordination and distribution of multi-ton shipments of cocaine from Colombian sources of supply into Honduras. These supplies are distributed to Mexican DTOs, including the Sinaloa Cartel and Los Zetas, led respectively by Joaquin “Chapo” Guzman Loera and Miguel Trevino Morales. Handal invests in and coordinates the receipt of drug-laden aircraft departing from Apure, Venezuela into Honduras via clandestine airstrips. He also facilities the movement of these drug shipments out of Honduras by land to Guatemala, where members of Los Zetas and the Sinaloa Cartel take possession. On March 3, 2011, the U.S. Attorney’s Office for the Southern District of Florida indicted Chepe Handal with one count of conspiracy to distribute cocaine with knowledge that it will be unlawfully imported into the United States. Today’s action would not have been possible without the support of the DEA and the U.S. Attorney’s Office for the Southern District of Florida. Since June 2000 OFAC has identified 97 drug kingpins and designated more than 1,200 businesses and individuals. Penalties for violations of the Kingpin Act range from civil penalties of up to $1.075 million per violation to more severe criminal penalties. Criminal penalties for corporate officers may include up to 30 years in prison and fines of up to $5 million. Criminal fines for corporations may reach $10 million. Other individuals face up to 10 years in prison and fines for criminal violation of the Kingpin Act pursuant to Title 18 of the United States Code. LOPEZ PEREZ, Gricelda (a.k.a. LOPEZ PEREZ, Griselda Natividad; a.k.a. PEREZ ROJO, Karla), Cerro de las Siete Gotas #642, Fraccionamiento Colinas de San Miguel, Culiacan, Sinaloa, Mexico; DOB 19 Aug 1959; alt. DOB 30 Dec 1966; POB Sinaloa, Mexico; nationality Mexico; citizen Mexico; C.U.R.P. LOPG590819MSLPRR04 (Mexico); alt. C.U.R.P. LOPG661230MSLPRR04 (Mexico) (individual) [SDNTK]. LOPEZ PEREZ, Griselda Natividad (a.k.a. LOPEZ PEREZ, Gricelda; a.k.a. PEREZ ROJO, Karla), Cerro de las Siete Gotas #642, Fraccionamiento Colinas de San Miguel, Culiacan, Sinaloa, Mexico; DOB 19 Aug 1959; alt. DOB 30 Dec 1966; POB Sinaloa, Mexico; nationality Mexico; citizen Mexico; C.U.R.P. LOPG590819MSLPRR04 (Mexico); alt. C.U.R.P. LOPG661230MSLPRR04 (Mexico) (individual) [SDNTK]. PEREZ ROJO, Karla (a.k.a. LOPEZ PEREZ, Gricelda; a.k.a. LOPEZ PEREZ, Griselda Natividad), Cerro de las Siete Gotas #642, Fraccionamiento Colinas de San Miguel, Culiacan, Sinaloa, Mexico; DOB 19 Aug 1959; alt. DOB 30 Dec 1966; POB Sinaloa, Mexico; nationality Mexico; citizen Mexico; C.U.R.P. LOPG590819MSLPRR04 (Mexico); alt. C.U.R.P. LOPG661230MSLPRR04 (Mexico) (individual) [SDNTK]. WASHINGTON – The U.S. Department of the Treasury’s Office of Foreign Assets Control (OFAC) today announced the designation of Griselda Lopez Perez, a wife of fugitive drug lord Joaquin “Chapo” Guzman Loera, who plays a key role in his drug trafficking organization. Today’s action, pursuant to the Foreign Narcotics Kingpin Designation Act (Kingpin Act), prohibits U.S. persons from conducting financial or commercial transactions with this individual, and also freezes any assets she may have under U.S. jurisdiction. OFAC is designating Griselda Lopez Perez for her role in the operations of Guzman Loera’s drug trafficking organization, including her efforts to assist Guzman Loera in evading justice. Additionally, Griselda Lopez Perez provides material support to the drug trafficking activities of her husband. Guzman Loera was identified by the President as a significant foreign narcotics trafficker pursuant to the Kingpin Act in 2001. Today’s action would not have been possible without the key support of the Drug Enforcement Administration (DEA). The U.S. Customs and Border Protection also assisted with today’s action.